Colon cancer is the name given to cancer in the large intestine, usually resulting from the cells of the colon mutating and multiplying to form cancerous polyps on the intestine. Colon cancer is one of the most common cancers identified in both men and women in the United States. It is the third most diagnosed cancer in the world, though the majority of diagnoses occur in developing countries. Despite being treatable, this type of cancer poses a high risk for persons who do not regularly undertake screening procedures, as it can easily spread to other parts of the body if left untreated. In general, the causes of colon cancer are not known. Most cancers develop as a result of the mutations of otherwise healthy cells. Cells within the body divide and multiply throughout their lifespan so that as older cells die, new ones can take their place. When the multiplying cells alter genetically, they invade and overtake the healthy cells and form polyps leading to colon cancer. The risk of developing colon cancer is high among both men and women, with each having a 20% chance of developing the cancer. 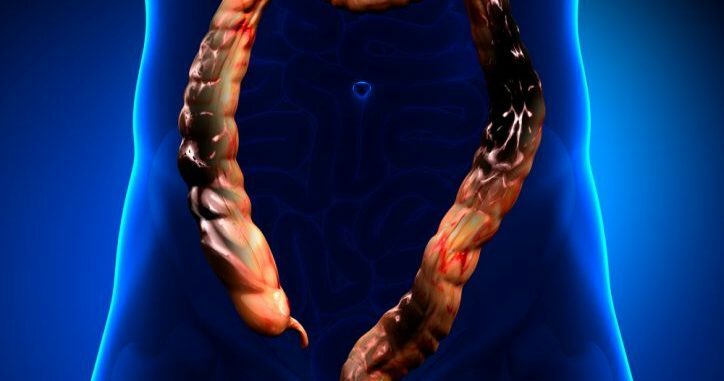 There are a number of risk factors that greatly increase the chances of an individual developing colon cancer. As a person ages, he or she has an increased chance of developing colorectal cancer. Preventative screenings are recommended beginning at age 50, with colonoscopies recommended every 10 years or sigmoidoscopies every 5 years. Those of African-American descent are also placed at an increased risk of developing this type of cancer, as are those who suffer from diseases causing the inflammation of the intestines such as Crohn’s disease or any other development of ulcer-like sore on the colon. Personal and family histories of colon and rectal cancer place individuals at a higher risk for developing colon cancer as well. Those who have survived previous colon cancer diagnoses are considered to be at a high risk of the condition reoccurring in the future. Those persons with a family history of colon cancer can undergo genetic testing to identify certain syndromes known to increase the risk of developing colon cancer if left untreated. Genetics also plays a part in the ability of the cancer to spread to other parts of the body. For persons with two or more cases of first-degree relatives having colon cancer, the chance that the cancer will spread greatly increases. The majority deaths that result from colon cancer are due to cases where the disease has spread. Personal and lifestyle choices can also have a great effect on the risk of developing colon cancer when compared to people living a healthier lifestyle. Those who choose to smoke, drink alcohol, or fail to exercise regularly place themselves as a high risk for developing this form of cancer. Other factors leading to a higher risk of developing colon cancer include obesity and maintaining a diet high in fat and low in fiber. Individuals whose diets include large amounts of red meat also increase their risk of developing colorectal cancer.